Sitting at a desk all day is hard on the back and legs. Circulation is cut off from the legs, which can cause swelling or a medical condition known as edema, and when the legs begin to swell regularly, this can lead to venous stasis, venous insufficiency and varicose veins. Leaning forward hunched over in a chair to see a computer monitor can cause backache and strain, while squinting to see a monitor that is too far away or too close can cause eye strain and permanent eye damage. In fact, there are many serious injuries that can be caused from improper seating and computer or desk workstation arrangement. The best way to start with good ergonomics in the workstation is to properly set up the workspace. Make sure the temperature in the room is comfortable and that the lighting is adequate. Sound levels should be at normal conversational level or lower the majority of the day. Arrange the desktop so that things used most frequently are closest, to prevent overuse or stretching and reaching. The desktop should remain uncluttered. The desk should be at a height so that the arms are nearly parallel to the desktop, without having to reach up or down to work. Sitting for long periods of time is hard on the back and the legs, especially when performing office tasks like computing. To prevent back injury and leg pain, the desk chair should be tall enough that the feet rest comfortably on the floor, and the legs do not dangle from the end of the chair. When the legs have to dangle, circulation is cut off from the lower part of the leg due to pressure put on the back of the legs by the chair’s seat. Read more about preventing varicose veins here. Also, leaning forward with no back support is very hard on the spine. The chair should have adequate back support and have a seat that is now too long so that it’s not comfortable to sit back in the chair without leaning backward. To prevent strain or injury at a workstation from the monitor being improperly position, position the chair so it is centered on the monitor. After this, move the chair so the monitor is approximately arm’s length from the sitting position. The monitor should be tilted slightly at an angle, approximately 10 degrees upward, to prevent having to bend or stoop to view. The top of the screen part of the monitor (not the case, but the screen) should be about eye level to the user. In order to prevent eye strain, be sure the monitor’s brightness levels are not too dark or too bright. The monitor should also be positioned at right angles to open doors or windows, so the glare from outside doesn’t shine across the screen causing additional eye strain. Keyboards now come with a warning on them from the manufacturer indicating that strain and permanent repetitive stress and carpal tunnel damage might occur with prolonged and improper use. 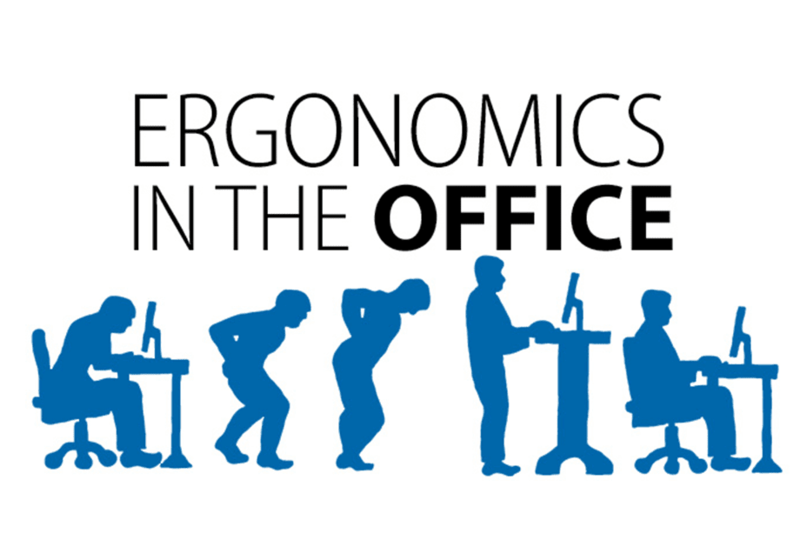 Ergonomic keyboards are available for purchase, and if the desk and chair are properly positioned, a good ergonomic keyboard will force the hands and arms into a position less likely to cause damage. The keyboard should be placed slightly lower than the desk and slightly higher than the thighs, approximately two inches over the thighs and slightly forward from the body. To avoid injury from working at a desk setting and avoid repetitive stress and other pains and injuries, it’s important to get up and move regularly. If unable to leave the desk or workstation, standing and stretching, bending over, closing eyes, and other exercises can help prevent stiffness, pain, soreness and long-term injury. Taking the time to set up the workstation and desk area properly and then following these tips can help prevent workplace injury and repetitive stress and carpal tunnel damage.